A41202813 asked the Answer Line forum for the best way to turn a bootable optical disc, like a CD or DVD, into a file that you could burn back into a bootable disc. Without the word bootable, the answer would be a no-brainer. You'd simply copy all of the files and folders on the disc into a .zip archive file. Then, when you needed them on disc, you'd copy them back. The problem, of course, is that the new disc wouldn't be bootable. Not good with a Windows or Linux disc. So instead, create an .iso file. This is basically an image backup of an optical disc--a compressed record of every bit on the CD or DVD. When you restore it, you make an exact copy of the original, including its ability to boot a PC. Windows 7 can natively read an .iso file and burn a disc from it. Older Windows versions need third-party software. Active@ ISO Burner is quite good and free. But to create an .iso file, I recommend another free program: ISO Recorder. Note, when you download it, that there are separate versions for 32- and 64-bit Windows. When you install ISO Recorder, it doesn't put itself in the Start menu like a regular program, but as a Windows Explorer shell extension. 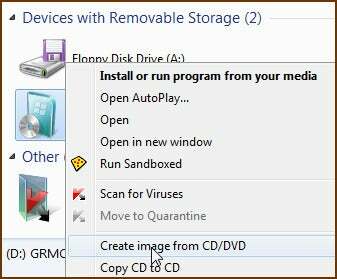 To use it, with the disc you want to copy in your optical drive, open Windows Explorer, right-click the optical drive and select Create image from CD/DVD. Then follow the prompts. By the way, ISO Recorder also works as an .iso burner. You can use it to burn the file back into a disc.